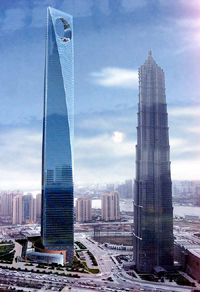 A Japanese tycoon Minoru Mori has built the tallest building in China – after a more than a decade of delays. The 101-story Shanghai World Financial Center, a 492-meter (1,614 foot) wedge-shaped tower with a rectangular hole at the very top, will be topped out on Friday as its last beam is laid. In a city whose skyline evinces the belief "the taller the better," the building is bound to be a major tourist destination and landmark. With China's economy growing nearly 12 percent a year and stock and real estate prices soaring, "The timing is just about the best it could be," Mori said Thursday. "When I saw the building this morning, at its full height, I thought it's really beautiful. I think we've really succeeded," he told reporters at Shanghai's Jinmao Tower, a silver spire next door to the World Financial Center that at 1,381 feet (421 meters) was China's tallest building until now. Mori's visions of a "vertical garden city" have transformed his hometown Tokyo's landscape with mammoth, mixed-use redevelopment projects such as Roppongi Hills, Ark Hills and Atago Green Hills. The 115 billion yen (US$1 billion; EUR720 million) Shanghai project by the developer's flagship Mori Building Co., due for completion in time for the 2008 Beijing Olympics, is a massive monument to the city's ambitions to reclaim its status as a key international center. It's also evidence that despite the political tensions that flare up between China and Japan at regular intervals, business is business. Mori acquired the land for the huge project, in the city's Lujiazui financial district, in 1994. Piling work began in 1997, and then halted for six years after the Asian financial crisis wiped out demand for new office space. By the time the project was revived in 2003, Mori had proposed and won approval from the Shanghai authorities to expanding its size to make it the world's tallest - a trophy for China and symbol of its growing affluence and economic might. The tower, buttressed by a conference center and shopping mall, will eventually house 70 floors of office space meant to accommodate 12,000 people, with a hotel, restaurants and an observatory at the top. Taiwan's Taipei 101, at 508 meters (1,667 feet) beat the building's height, taking the tallest sweepstakes in 2004. Developers of a skyscraper in oil-rich Dubai recently declared theirs the world's tallest building when construction reached 512 meters (1,680 feet) - and the building is still far from completion. Along the way there were other hurdles, including a fire just weeks ago. Sparked by welding work, it broke out in an elevator shaft on the 40th floor of the building and was extinguished after more than an hour, without any reported casualties. After the Sept. 11, 2001, terrorist attacks in the United States, the building was redesigned into a so-called "megastructure," with four huge pillars to make it stronger, Mori said. Later, the builders altered another key design feature - a circular cutout near the top - after complaints that it resembled the rising sun on Japan's flag, a symbol reviled by many Chinese because of Japan's brutal occupation of the country in World War II. Mori obliged, changing it to a rectangle. "For us it wasn't such a big deal to change it and it pleased the Shanghai authorities," he said. "We were happy to do it because it didn't cause any real delays." Mori shrugged off the issue of political tensions - real enough that they flared into sometimes violent anti-Japanese protests in Shanghai and other Chinese cities in 2005. Construction never halted because of the protests or any other political problems, he says. "We were never bullied because we were Japanese," he said. "This is everyone's landmark which belongs to the Shanghainese and will be the pride of Shanghai." Mori Building claims nearly full occupancy in its two other mainland China projects and given strong interest from many international financial firms expects occupancy in the new building to be at 90 percent by the end of 2008, said Hiroo Mori, the senior Mori's son-in-law and a managing director of the company. He said plans call for rents of more than US$3 (EUR2) per square meter per day, higher than originally expected. Higher than forecast profitability means that the company expects to recoup its investment within 15 years. "So far, this project has surpassed our expectations," he said. The senior Mori discounted talk of a possible "bubble" in asset prices, noting that despite an unprecedented building boom Shanghai still has less than one-fifth the top quality office space to be found in Tokyo. "I've lived through a bubble and I still think the trend here is part of a normal economic growth path," he said. "This kind of fast growth and future economic prospects can't be found anywhere else. I think we made the right decision."